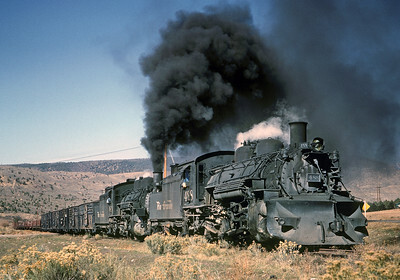 In the 1960's the remaining Denver and Rio Grande Western narrow gauge line ran from Alamosa to Durango, with branches to Farmington and Silverton. It was a very photogenic operation in several respects. In addition to the novelty of being three foot narrow gauge, it was the last mainline steam operation in the U.S. , using steam until freight operations were abandoned in 1968. 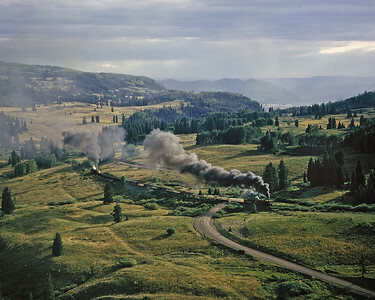 And trains ran through picturesque western American scenery, including 10,000 foot Cumbres pass. Despite operating with an ancient car fleet with many wooden underframe cars dating back to the 1890's, it often ran long trains with 60-70 cars and two engines that had to work hard on the grades. 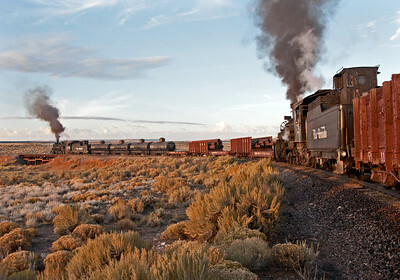 When freight operations were abandoned two significant portions of the railroad survived as scenic tourist railways, the Durango and Silverton Narrow Gauge Railroad, and the Cumbres and Toltec Scenic Railroad, continuing the steam operation into the 21st century. I first visited these lines in 1960 and photographed their last years of freight operations. And I have returned regularly since then to photograph the surviving tourist operations as well as historic recreations of the freight trains. There are a lot of pictures in these galleries, the Personal Favorites gallery will give you the short version.